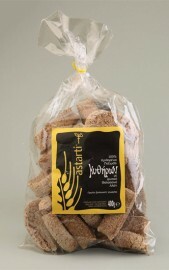 Astarti organic 100% barley dry bread-rusks(paximadi) with natural sea salt, double baked. 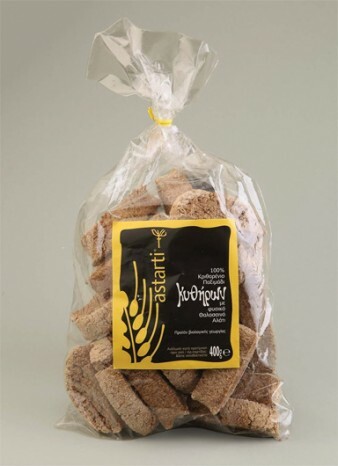 By following baking tradition of Kythera and according to the recipe and instructions of nutritionist Evangelos Zoumpanea we have created in the bakery in our village of Karavas, this unique paximadi (rusk). 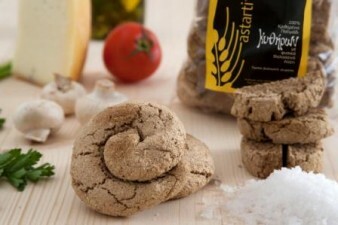 We chose the cleanest Greek certified organic raw materials, produced by small producers, such as barley flour from whole grain stone mill and natural unrefined sea salt from the sea rocks of Kythira, the origin and value of which is guaranteed by Astarti. The beneficial results of β-glucan are ensured with a daily intake of 3 gr of β-glucan from barley, oat bran, barley bran, or a mixture of these β-glucan products. The significance of a well balanced, varied diet and healthy life style must be emphasized. Tips for Use : In order to enjoy the maximum nutritional value of each paximadi, our Dietician suggests dipping very quickly into a bowl of tepid water to make it more palatable; drizzle half a teaspoon of olive oil over it to provide the beneficial vitamin E and good fats derived from the fruit of the olive; finally sprinkle with a little fresh oregano which possesses antiseptic properties. In addition, you may use it just like cereals for a healthy breakfast, full of fibers and β-glucans. 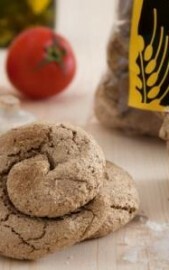 For more tips of use on dry bread (rusks), you may visit the following link (http://www.lifo.gr/team/elenipsychouli/45328) from chef Mr. Eleni Psychouli . “Ntakaki” or Barley bun (av. 60g per pcs), in plastic (PP) packaging of 420g. Nutritional information by Dietitian Evangelos Zoumpaneas. Barley:The beneficial properties of this valuable grain. Barley, known since ancient times for its beneficial properties, is a grain rich in vitamins B3, B6 and minerals like potassium, iron, sulfur and phosphorous. The husk is low in fat and contains more soluble fibres than any other grain, contributing to the prevention of diabetes by significantly reducing the glycaemic index of the diet, at the same time improving the body’s ability to use the insulin in the cells by lowering sugar levels in the blood. Barley contains tocotrienols which help to reduce production of cholesterol in the liver. The beta-glucan barley along with the other soluble fibres do not allow cholesterol and dietary fats to be absorbed in the intestine (Balch, 1998) thus contributing to the reduction of blood lipids. Barley flour contains minimal gluten so it is more digestible than other cereal flours thereby substantially reducing the common symptoms of indigestion and bloating. Due to its high content of nutrients it is beneficial to the regulation and control of appetites. Natural Sea Salt: The beneficial secrets of a nutriment dating back to primeval times. By nature, unrefined sea salt not only contains sodium but an additional 91 different types of minerals in ideal proportions. Accordingly, this provides an important source of essential minerals and trace elements required by our bodies to function properly. The use of non-refined sea salt, such as natural salt from the rock pools of Kythera, combined with a wide selection of unprocessed foods in a daily diet is an excellent means for acquiring good physical and mental health. Dietitian Evangelos Zoumpaneas is founder and member of the Scientific Group NUTRITION www.diatrofi.gr. ; publisher of the journal Nutrition Health & Wellness; Chairman of the Institute for Nutritional Studies & Research www.insr.gr. ; author of the book Nutritional Intelligence amongst others and with postgraduate studies specialising in Nutritional and Psychological Treatment for Eating Disorders. Mr. Zoumpaneas is also the CEO for the Centre of Education & Treatment for Eating Disorders – KEADD, www.keadd.gr.